Different standards + different procedures = different results. We now have videos showcasing our guns; test firing, proper cleaning and other precision shooting related subjects. Watch, learn and enjoy! Currently we have nine YouTube videos! 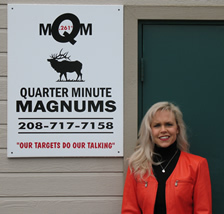 YouTube Video link: Quarter Minute Magnums - Seeing is believing! The quest has always been for the perfect 0.000" group. No peace, rest or satisfaction until all the bullets go through the exact same hole. Five shots or ten, 100 yards or 1,000, the obsession demands that all the bullets go through the exact same hole. This is not what we do. This is who we are. Now building 30 Nosler with Berger 210g. Now building 28 Nosler with 195g Berger's. Cartridge overall length will be approximately 3.765" with bullet seated to optimum depth. 6XC Norma with 105g Bergers - 2.700" c.o.a.l. Also, starting 1/1/17 we will no longer sell a rifle to anyone who is not a current National Rifle Association member. However, if you are not an NRA member and you wish to purchase one of our rifles, we will gladly pay for your membership assuming you are willing to join the NRA. More Important Information Coming Soon!